The Global Holiday Tree will be in Loretto Hall outside of Marletto's Marketplace through the month of December. 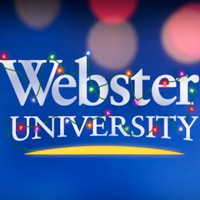 To celebrate the rich diversity of Webster University’s worldwide network during the holiday season, a uniquely decorated Global Holiday Tree will once will be on display in Loretto Hall, Outside of Marletto’s Marketplace throughout the month of December. 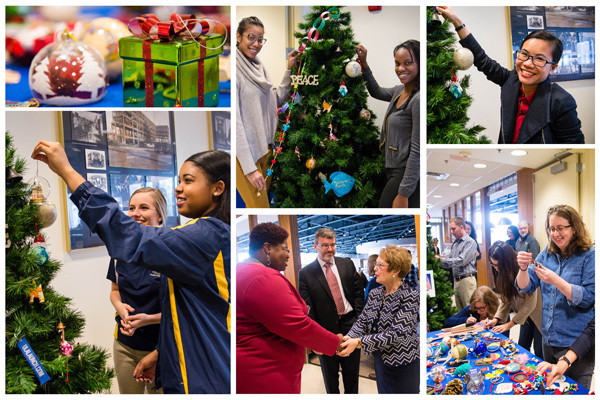 New ornaments submitted from around the Webster worldwide network are added to the permanent collection that decorates the tree each year. Global Holiday Tree Trimming Party - Nov. 28, 12 p.m.
President Elizabeth (Beth) J. Stroble and Provost Julian Schuster invite students, faculty, staff and alumni from every Webster campus to help trim the tree and share their holiday traditions by sending an ornament that tells their holiday story. Items will not be returned so we may continue the tradition every year. Please bring your ornament to Loretto Hall, outside of Marletto’s Marketplace. The Global Holiday Tree Trimming Party on Wednesday, Nov. 28, from noon-1 p.m. Enjoy holiday refreshments while adding an ornament or a New Year’s wish to the tree.